but we will be incredibly thankful if you do! SusanvilleStuff is our area's only locally owned news and information source and our commitment is to our friends and neighbors, with the goal of creating the best, all-around, most reliable content, while at the same time highlighting what makes Susanville and Lassen County so incredibly unique. 365 days a year we act as eyes and ears for our neighbors, and the lens that nearly 20,000 people each month see Susanville through. Think of that – when people on the internet around the world see Susanville, they see us on SusanvilleStuff.com. Someone relocating and looking for a house to buy, a place to work, a retail location for their business, or a place to move their family will type Susanville into a search engine and find SusanvilleStuff at the top of the list. We try and show them the very best Susanville we can. 10,900 people follow us on Facebook. That means each time we post a story 10,900 of you know it instantly. Susanvillestuff averages more than 600,000 page views each month. We are Susanville’s largest influencer across a variety of social media platforms. Everybody knows about SusanvilleStuff and that is awesome! Our independent, local coverage takes a lot of time, money and hard work to produce. It is also not particularly lucrative. Our primary revenue source, banner advertising on SusanvilleStuff, is simply not enough by itself, and we increasingly need to rely on reader support to pay the bills. Every dollar our readers contribute goes towards making SusanvilleStuff a stronger voice in the community with better, more comprehensive content. 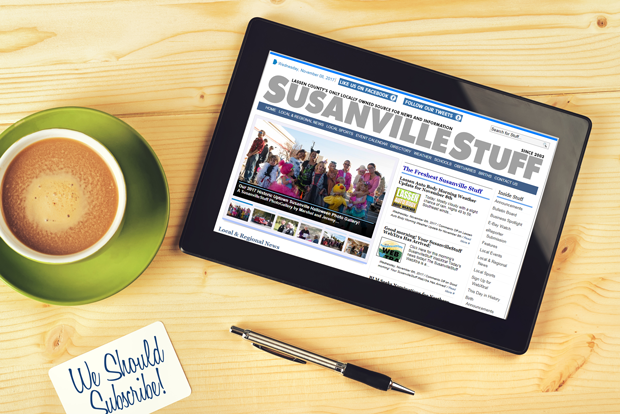 We are committed to never putting up a paywall for our readers, and content on SusanvilleStuff will always be free. These contributions are completely voluntary, and very appreciated. Remember, you don't have to subscribe to SusanvilleStuff, but we will be incredibly thankful if you do! Our voluntary subscription is $4.95 each month and you can cancel your subscription at any time. Instead of a recurring subscription you can make a one-time contribution to SusanvilleStuff. Just pick an amount from the drop-down menu below to choose your level of support. Too much? Not enough? Use this option to pick your own amount for the one-time contribution to SusanvilleStuff. We offer some simple, effective advertising packages for businesses as a way of supporting our mission, while providing a great mechanism for them to reach potential customers. It's a cost-efective way to help make SusanvilleStuff a powerful voice in the market while at the same time benefitting businesses with quality banner advertising on our pages. SusanvilleStuff is owned solely by Couso Technology and Design, whose role it is to secure the editorial and financial independence of SusanvilleStuff.com in perpetuity. to promote, inform and entertain on a fair and reliable basis. SusanvilleStuff, please contact us here.